Religious Orders founded during the Middle Ages often gave birth to a specific branch for lay people. It is the case of the Dominican Order. The Lay Dominicans were granted their first rule in 1285. The present rule was enacted in 1985. It reads in particular "Some lay persons, moved by the Holy Spirit to live a life according to the spirit and charism of Saint Dominic, are incorporated into the Order by a special promise according tostatutes proper to them.(...) As members of the Order, they share its apostolic mission, by study, prayer and preaching according to the state proper to lay persons." Lay Dominicans gather monthly at the Studium Catholicum. The group comprises ten members at the moment. They are professionals or retired men and women. The first members took their first vows in 1992. During our meetings, we try to comment together on Scriptures, hear presentations on different subjects, familiarize ourselves with various aspects of the Dominican Order, take part in Mass, share a meal and engage together in open discussions. Once a year, on the day of our patron-saint St. Catherine of Siena, we organize a lecture open to everybody. A common celebration of Vespers follows. We also organize a pilgrimage each year to the church of the Holy Cross in Hattula. It takes place sometime around the 14th of September, the feast of the Exaltation of the Cross. 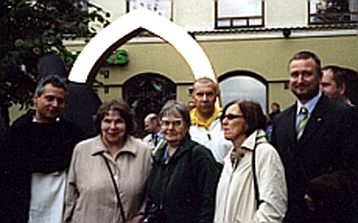 Lay Dominicans also maintain connections with similar groups throughout the Nordic countries.